This past Thanksgiving Day was one of the biggest moment's for Arise Africa probably in our history. We were accepted to have 7 kids in our full custody and in our family FOREVER! They are moving into the orphanage in a matter of weeks! On Thursday morning our social welfare worker and a judge went out to the compounds and met the 7 kids we have been working so hard to get in our home. We were nervous for many reasons. We didn't know if they would actually come or if they would accept all the kids we wanted. We were worried about who might show up and claim these kids were their's when they weren't. We didn't know if the judge would like us or not. We weren't sure if Peter Mumba, the oldest of the 7 would make the cut because he might be considered too old. As I waited to hear the news in America I had to continue to tell myself that God has this. We hadn't come this far and seen his provision through the entire process to get to this point and not believe. At 3:12 AM on Thanksgiving morning my cell phone rang. When it rings in the middle of the night that means it is someone from Africa. I picked up the phone and was immediately heard someone saying "We got them all!" Words cannot express the relief, excitement, and gratitude I felt at the moment. We GOT THEM! These kids have been in our child sponsorship program for years and we have watched them suffer and struggle. They can now be taken care of correctly. They are the worst off, with no love or care other than what we can provide at the schools. They have slept on the school hallway floors, at the city dump, and in the streets. They have eaten only one meal a day, which is the one we provide at achool. We no longer have to worry about what happens to them when they walk out of the schoolyard everyday. But NOW, they are going to a home and sleep on a mattress for the very first time. They are going to go to a great school and never have to worry about where their next meal will come from. They will always have soap and clothes to keep them warm. They can learn to read because there will be books in the library for them to pick up anytime. They can learn how to use a refrigerator and indoor plumbing. They can be kids. And they have a family, for the first time in their live. worked with her in our child sponsorship program. She is a shy child that needs a lot of love. Alliness is 10 years old and in the third grade. houses, and at the school. Arise Africa has taken care of Dorothy the best we have been able to. She loves math and science and is a sweet child. She deserves a loving home where she never has to wonder where she will sleep tomorrow. Dorothy is 9 years old and in the third grade. seizures. She has a fun, loving, and sometimes cute and mischievous personality. Nelly is 8 years old and in the first grade. majority of her time in a remote village a few hours away. They have lived by themselves, in the school hallways or at the city dump. Brian has a major sense of responsibility to care for his younger brother, Armond. This sometimes keeps him out of school as he goes to the streets to beg for food. Brian loves to read. He wants to be a pilot when he grows up. Brian and Armond have never slept in their very own beds or have had three meals a day. Brian is 11 and in the 5th grade. We first met Brian and Armond Banda in August of 2010 in our child sponsorship program. The brothers have no living parents but a grandmother that spends the majority of her time in a remote village a few hours away. They have lived by themselves, in the school hallways or at the city dump. Armond loves school and likes to color. Brian and Armond have never slept in their very own beds or have had three meals a day. Armond is 9 and in the third grade. after meals and he was close to death about a year ago. We took him out of the home and sent him to an orphanage run by Catholic Nuns. They helped him back to health by feeding him every hour or two for months, which enlarged his stomach. After his time spent in the orphanage we moved Andrew to another school where he has been living with the headmaster and his wife temporarily. Andrew is 14 years old and weights 56 pounds; he is in desperate need of a home where he can be well nourished and loved. Andrew is extremely smart and loves school. He loves to play soccer and is very shy. He wants very badly to be treated just like any other child and go to a good school. Andrew is 14 and in the seventh grade. Peter is our oldest child that will be living in the home. Peter lives in a home that has way too many people and the conditions are not healthy. A few people in the home died of cholera last year. He sleeps on a dirt floor and comes to school very dirty. He struggles during the rainy season because his feet are constantly wet and become infected. He works hard in school and is a great leader. Every opportunity we give him he is very grateful for. 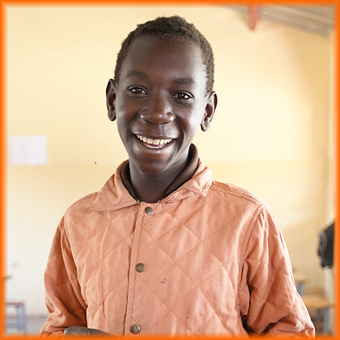 He takes care of his school uniforms and supplies and is very thankful for everything we do. Peter hopes to be a pastor one day. We are so blessed to have Peter in the home with his cousin, Andrew. We know Peter will be a great leader in our house. Peter is 17 and in the seventh grade. We are now in the process of getting all of these kids sponsored and financially cared for. Having children in your full custody is not cheap. I sure that every parent can attest that KIDS ARE EXPENSIVE! The cost per child is $450 per month. We are trying to keep costs down but there are some things that we cannot cut corners on. One of these things is their education. They will attend a very nice private school that is walking distance from the home. Their school alone is $120 a month. It is one of the best in the city. We also want to make sure that in the first year running this home that we have enough funds to care for them. One of our concerns is medical expenses. We need to make sure we are ready for anything. There are some other things that we hope to be able to provide as well like counseling and extra tutoring for the subjects these kids are behind in. The kids will need some adjusting and the places they are coming from are pretty tough and most have had pretty traumatic lives. There are going to be some emotional things to work through. We want to help them as much as possible and be equipped to love and care for them well. Unfortunately this costs money! We are praying that we can get groups of people to sponsor one child. Every child on this list will have multiple sponsors and we ask you to consider helping sponsor any of them. We are starting orphanage sponsorship at $50 a month. You are more than welcome to pay more than $50. 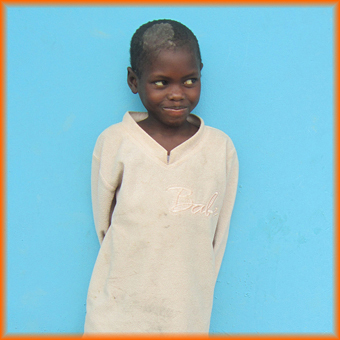 When you sign up for sponsorship you will receive monthly reports from the home and bi monthly reports on your kiddo. We also will make sure you can write you child multiple times a year and send photos and small packages and communicate through mail. The kids will write back which is really fun. And of course we would love for you to visit the home anytime in Zambia! If you are ready to help us out you can sign up for a child you can make a credit card donation. 2. Fill in your contact information and gift amount for at least $50 or more. Make sure you choose the monthly option for your donation. This will automatically charge your credit card every month. You are finished! Remember that all donations are tax deductible. 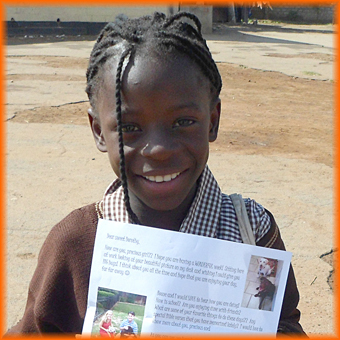 If you sign up to sponsor a child we ask you to write a letter to them quick! We will be taking them over for the kids to open and have on Christmas day! Make sure to include a photo of you. We would still love for you to be a part of this incredible home. You can go online and make a donation just like we explain above and put it in the the Kershaw's challenge / orphanage fund. You can do a monthly withdrawl from your credit card as well. We will use these funds to be able to have special events and things for the kids. Some of these fund might be used to take kids to a movie, or a sporting event, or even a restaurant. The extra funds would be used for tutors or allowing the kids to do after school activities that cost money. We would use these funds to buy educational games and other things for the orphanage library. We also would love to be able to but individual christmas gifts for each child as well. IF you donate monthly to this fund we will send you the monthly report on the home so that you are aware of how these funds are being used. Great! We love to answer questions! Please email alissa@ariseafrica.org or call at 210-602-1698. We are more than happy to answer any question.